Each week this spring, we’ll be introducing one or two of the new lesson plans on AHTR with commentary from the lesson plan authors themselves. First up–Prehistory and Ancient Near East. 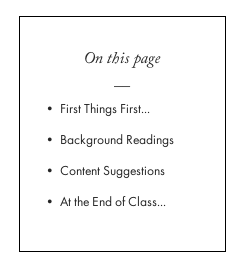 Each new lesson plan is split into four sections to make it consistently easy for users to understand what types of content to expect: “First things first” suggests way in which you can “icebreak” each lesson and get the conversation started; “Background readings” suggest places to look for your own general reading if this subject isn’t your forte, as well as for your students; “Content suggestions” offers a ready-made PPT that you can take and make your own, as well as a bullet-point list of 5-8 works you could use in your lesson plan and a longer explanatory contextualization of the ways in which you might move through the list during your lesson; finally, “At the end of the class” gives you options for assignments or final questions to wrap things up with. the lesson plans are always starting points–they’re not designed to be comprehensive, nor didactic. They’re springboards, ways to save you time and offer you new perspectives on teaching topics that may be outside your area of research–or so familiar to you that you’d like a way to refresh them. The AHTR lesson plans have all been written by PhD candidates or professors of art, architectural, and design history. These very first two lectures were written as “models” for our other contributors to ape the structure of when writing in their own fields of expertise. Although they’re certainly solid in terms of content, the lectures for Prehistory and Ancient Near East were the templates we began this lesson-plan building project with, and so we’re eager for your feedback on them to fill the gaps and make them stronger. As always, leave your comments and thoughts below. Talk to Your Prof…But How?